1. The stem apex is flat and very small; perhaps four rudimentary leaves and three primordia present. Fig. 4.1. 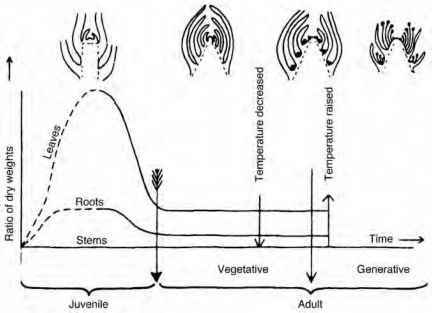 Illustration of the developmental stages of the apex of Brussels sprouts (Brassica oleracea var. gemmifera) (Stokes and Verkerk). 4.2. 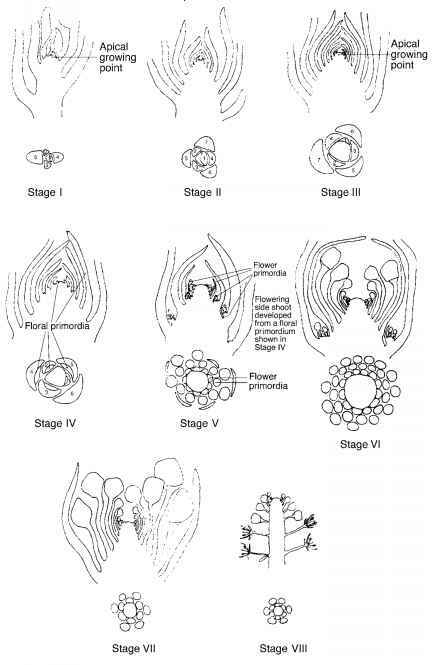 Illustration of the changes in the structure of the apical growing points and the distribution of growth during the juvenile, vegetative adult and generative stages in Brussels sprout (Brassica oleracea var. gemmifera) (Stokes and Verkerk). Dry weights of leaves and roots are represented as multiples of stem dry weight. At puberty, the stem apex becomes pointed, the growing point enlarges and the apical bud becomes swollen by the increasing numbers of leaves and primordia. Once the growing point becomes dome shaped, Brussels sprout plants will flower following an exposure to a period of cold. Rapid enlargement of the growing point and top bud; the growing point becomes a globular structure on the apex of the stem and the leaf primordia enlarge. This stage is reached once the plants have been subjected to cold, the first floral primordia become visible in the axils of the leaves. Primordia are present on the actively growing buds; usually only those in the apical buds continue to full development. Buds lower down the plant will develop much later and, if given sufficient exposure to cold, they can develop into flowering shoots. At this point, the triangular arrangement of the apex is lost and the shape becomes rounded as progressively larger numbers of initials segregate round the growing point. Although this is the first indication of potentially generative structures, the change is reversible since if the plant is returned to warmer temperatures the buds will form only leafy shoots. Plants resulting from the reversal of environment from cold to warm retain the phyllotaxis of a generative plant; they bolt but form no flowers and the apices of the leafy shoots remain in stage 3 (above). As more buds segregate from the apex, the development of flowering buds takes precedence over that of leaf primordia, until the latter show solely as rudimentary lobes and eventually completely disappear. At this stage, only flower primordia segregate from the apex. 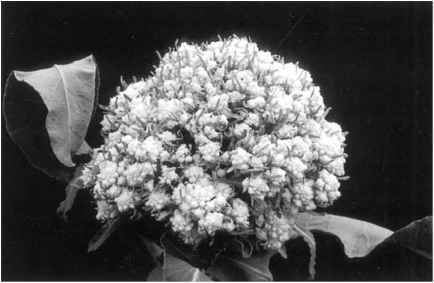 The apical meristem reaches maximum size containing large numbers of flowers at varying stages of development and 30 or so leaves. The bud is visible to the naked eye when the leaves are removed. This is the flower bud stage where the buds open out displaying individual flowers prior to bolting. The apical meristem decreases in size. This is the bolting stage where the apical meristem is very small and only a few initials are cut off together; the growing point is permanently retained but no flowers are formed. Some primordia become arrested in growth so that the plant eventually dies with a terminal growing point still present. The change to the flowering state is accompanied by alterations to the general morphology of the plant. 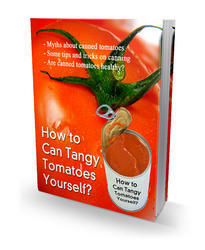 This follows a reduction in petiole length and the production of long strap-shaped leaves towards the top of the plant. These leaves have an increasingly wider angle with the stem (after Stokes and Verkerk, 1951). In Brussels sprout, the number of leaves determines the number of potential bud sites for the formation of the crop of harvestable sprouts. During crop growth, there are two distinct phases of leaf formation. In early crop growth, the rate of leaf formation is faster than in later periods. Leaf initial formation increases with later planting, but the lower rate of leaf formation is reached earlier with later planting. In the first phase of crop growth, planting density has no influence on the number of leaves formed. Subsequently, the number of leaves formed at high cropping densities lags behind that formed at wider spacing. Late and higher density planting restricts leaf formation and ultimate ware sprout yield, but these factors appear to operate independently of each other. Leaf area index (LAI, leaf area per unit area of land, Watson, 1947) reaches maximum values (5-6) at between 80 and 100 days after transplanting and then decreases to values of 1-2.5 in the second half of the crop growing period and through to harvesting. Development of LAI is faster with crops that are planted later but is heavily influenced by planting density. Specific values of LAI are attained more quickly in earlier planted crops. Stem length is greatest in the early crop growth phases with later plantings. The rate of increase of stem length decreases most quickly with later plantings compared with early and second planting dates. Planting density has little effect on the ultimate crop height. Dry matter production at harvest was highest with early plantings, although crops planted very late in the season (i.e. late June/early July) showed the fastest initial accumulation of dry matter. Sprout bud initiation is greatly influenced by planting date. The buds start appearing between 21 and 32 days earlier with later plantings, i.e. further into the calendar year, and are unaffected by plant density. Bud dry weight was always lower with later planting dates. Buds finally formed in approximately 80% of the leaf axils. Increasing plant density reduces the final fresh weight per bud. Brussels sprout crops intercept as much as 90% of available radiation at LAI 3.5-3.8; this stage is reached 50-70 days after transplanting. LAI values of 3.5 are attained most quickly by later transplanted crops. This had little practical value, however, since radiation use efficiency (RUE) declines within these crops linked with the seasonal reduction in incoming radiation. Crops transplanted early in the season make the most efficient use of the environmental resources available to them. The grower's most effective strategy is to develop high LAI sufficiently quickly to exploit maximum available incoming radiation during the early summer months. Where planting dates are similar, bud initiation commences more quickly in early maturing cultivars compared with those maturing mid- and late season (Fisher and Milbourn, 1974). Bud initiation tends to start earlier with low crop planting densities, commencing when the total amount of assimilates produced can no longer be utilized completely by the growing apex. Such assimilate 'saturation' may trigger a hormonally regulated start to bud growth. Bud initiation continues up to harvesting, leading to a spread of bud ages up the plant. This resultant spread of bud maturity affects postharvest quality and shelf life. Traditionally, the sprout buds were selectively harvested by hand labour 'picking-over' the crop several times per season. The advent of machine harvesting does not allow grading in the field. Produce which is mechanically harvested in the field and destined for the fresh market needs to be graded for size and maturity mechanically and by the human eye in the packing shed. High yields are achieved most efficiently by planting as early as field conditions will permit. This is constrained by the possible incidence of low temperatures which encourage vernalization and flowering in preference to sprout bud formation (Everaarts et al., 1998). How to increase brussel sprout growth stages? What growth stage is a sprout? What are the four stages or phases of crop growth development and production?